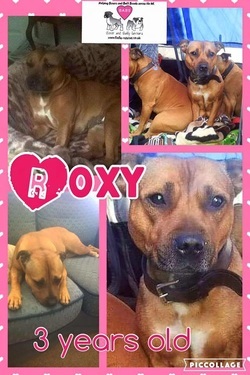 Roxy is a 3 year old staffie. 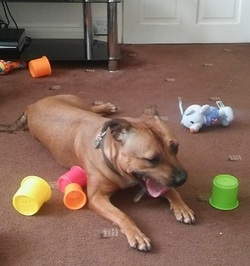 She adores people but as she thinks all toys are hers we would only rehome to adults only or families with older children. She got on well with every dog she has met while in foster, but no cats! "Say hi to foxy Roxy, she loves her food, playing and sleeping. She does not like little kids as they are to grabby, and she does not like to wear her Halti, she is learning her basic commands and now can sit and wait for food rather than launching for it. She lives well with other dogs and seems to get on with my ferrets. Not cat tested"
If you are interested in adopting Roxy please contact us . Homecheck and adoption donation apply.